The theme for this month’s Poppins Book Nook virtual book club is Planes, Trains, and Automobiles. We took the theme and interpreted it as any viable way to get around. We ended up at… dog sleds. Particularly, we were interested in books about the dogs involved in the serum run of 1925 from Anchorage to Nome, AK. If you aren’t familiar with the history of this relay, read up on it. It is an interesting story that shows that helping others is not always the easy thing to do, but it is the right thing to do. Because so many chose to help others, the city of Nome, Alaska, avoided being wiped out during a diphtheria outbreak. The medication was in Anchorage and, being as it was winter, the only way to get it to Nome was by dog sled. This normally took 30 days but it was estimated that the city would be devastated by the disease in only two weeks. They had to move fast. Moving the serum from one dog sled to a fresh team every so often, they covered the 700ish miles in 5 1/2 days. While Balto is the most famous of the dogs to assist in the relay (he and his team ran the last two legs of the relay), Togo was the lead dog of the team that went the farthest (they ran almost 300 where most other teams ran 25-30). There were a total of 20 mushers and teams that assisted. Dogs: We looked up the various types of dogs that are often used as sled dogs. We discussed the characteristics of them and some of the things that make them unique. The girls drew some dogs but for some reason, I don’t have any pictures of them and I don’t know what they did with them. Sleds: We talked about the features of a sled, based on the illustrations in the book Sled Dogs Run. 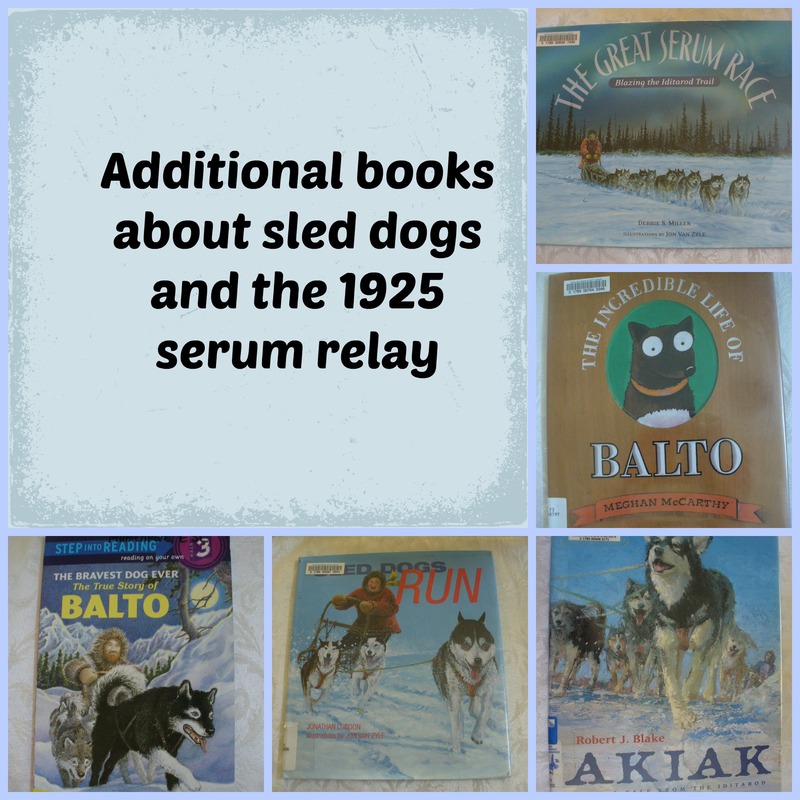 We discussed the type of preparations that would be needed for the type of run that took place in that book and we compared it to the type of preparations that were made by each of the mushers helping in the serum relay. This was done verbally. Balto: I asked E, the oldest, to tell us the story of Balto, knowing she had read the books and had asked a bunch of questions. After she did, she asked if we knew anything else about that dog. So, we picked up yet another book from the library: The Incredible Life of Balto by Meghan McCarthy. 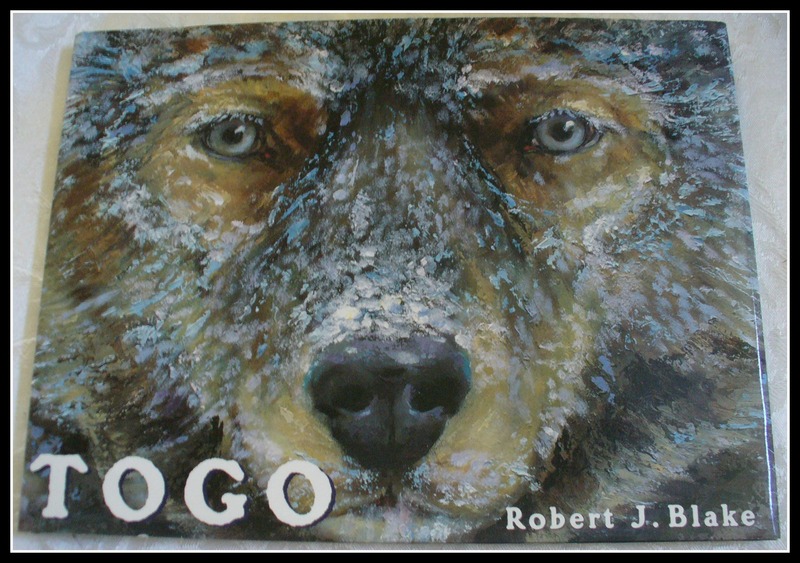 This book fills you in on the story of what went on with Balto after the serum run. We looked up a picture of the statue in New York City’s Central Park, as well. Make a sled: This was spontaneous play by the girls, which I love! 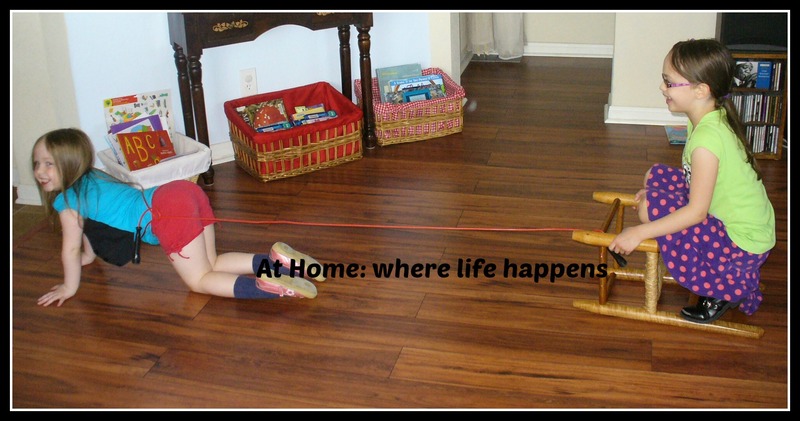 They used a jump rope and turned a small chair upside down on its back. Then one of them was “hooked into” the lead, one stood on the chair, and viola! a dog sled. They pulled each other around the living room for a while (until it was decided that maybe they shouldn’t treat their great-grandfather’s chair like that – eek!). Of course, they immediately began pretending with the jump rope and trying to find another way to pull each other. The final choice was, I believe, blankets. Not quite so realistic but much better than ruining the chair or the floor. 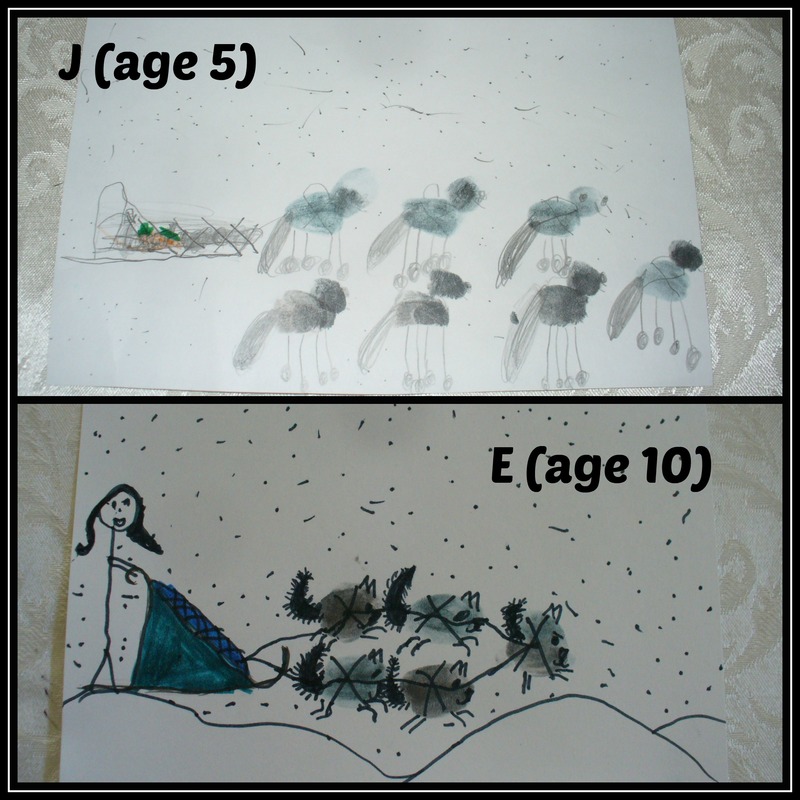 Art work: We used an example from Iditarod Teacher On The Trail to make some art work. Using our thumb and finger prints for the dogs, we created dog sleds. 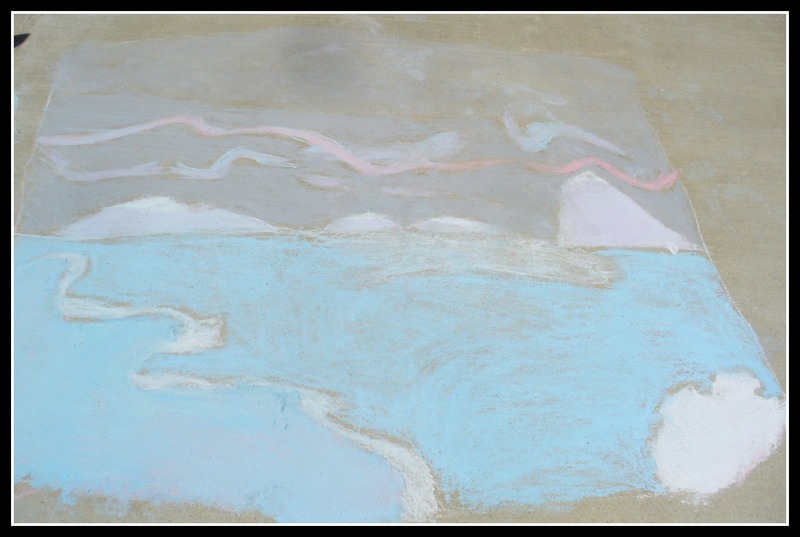 Art work – skies: One of the things I find fascinating about Alaska is the big sky. I don’t know if it is true but you often see the pictures of the expanse of ice for the land and the big sky above it. There are several pictures like this in the books we read, so we recreated one of the pictures from Togo. Of course, we did it in chalk as a group project in the driveway. That about sums up the study of Togo and the other dog sleds and the great serum relay of 1925. A fascinating story with lots to do from it. I should have allowed more time but I am sure we will have a chance to revisit this sometime in the future. Until then, we’ll keep reading and we’ll see you next month for Folktales with the Poppins Book Nook. At Home. 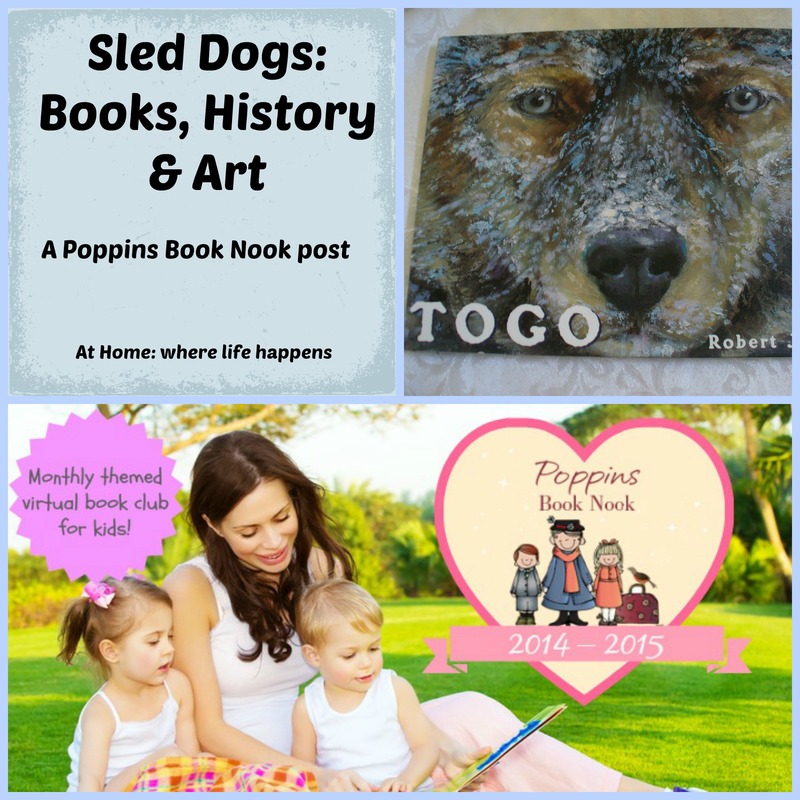 Head over to the home of Poppins Book Nook where you will find a ton of fun freebies, including lapbooks to go with this month’s theme, and an awesome giveaway to enter for books and goodies related to this month’s theme. 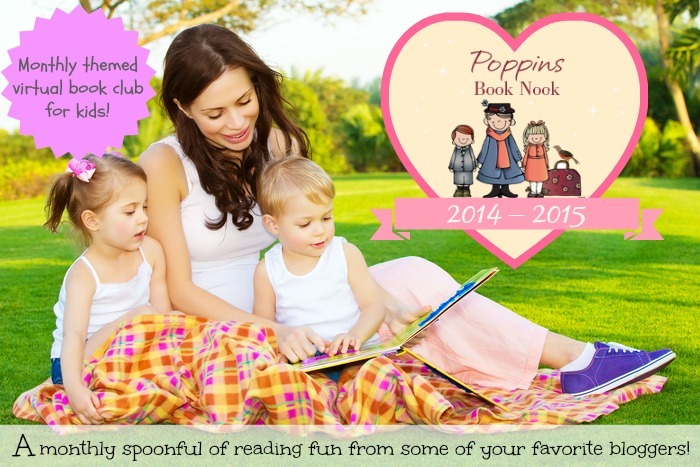 Follow Poppins Book Nook on Facebook and Pinterest! Yea – I am a bit more lenient about these things and I let it go for a bit. (You know, long enough for them to have a bit of fun and me to get a picture!) Luckily, the chair wasn’t hurt. I, too, love it when we can see the evidence of their engagement with a subject. I love the dog sled, what imaginative kids you have. Sled Dogs are interesting. I going to add Togo to our to read list, I know my daughter will love it. I love to see the girls’ imaginations at work. Thanks for dropping by, Jill. 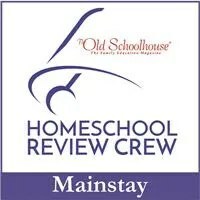 We have enjoyed Poppins Book Nook and are so excited to be a part of it.